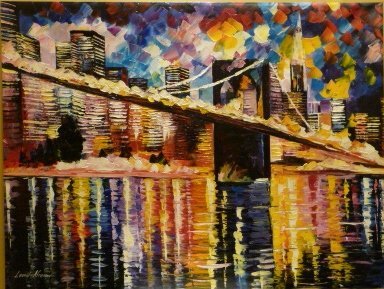 BROOKLYN BRIDGE AT NIGHT is an Original Oil Painting on Canvas by Leonid Afremov. Image: 30 x 40. Gallery Retail is $8,500. The artwork is in perfect condition. It is an Original artwork. It is NOT a gicl’e or recreation of the original – Again, it is the ORIGINAL! Medium: 100% hand painted oil painting on Canvas by Leonid Afremov – One of Kind Original Painting – Signed by Leonid Afremov. Certificate of Authenticity is directly from the artist. Firerock Fine Art is an official Afremov Gallery based in Fountain Hills Arizona. All Afremov artwork purchased from our gallery comes with a Certificate of Authenticity issued directly from the artist. We enjoy an excellent relationship with the artist and his family and enjoy much success representing him across the USA. Our primary focus is the sale of Afremov Originals on Canvas. That said we can also provide most any artist recreation or gicl’e Leonid publishes. If you don’t see the piece you want in our store, ask a question at the bottom of our Amazon ad and we will promptly reply with a quote. AUTHORIZED AFREMOV RESELLER #: 170023.